Rash on chest with pus filled postules. This skin rash appears only on the chest area of my body. It has very superficial pus filled postules that are extremely tiny. As a treatment for this rash condition, I have tried Cortisone cream, Calamine lotion, and drying it after showers. I do swim a lot and work at a veterinarian clinic where I consistenly hold animals against my chest. The chest rash that I have DOES NOT ITCH. It just makes the skin on my chest look terrible. I have been wearing loose clothing to let it "breath" and sometimes omit wearing a bra, again to help it "breath." I am really at a loss at what else I can do. The treatments I have tried do not cure this rash. 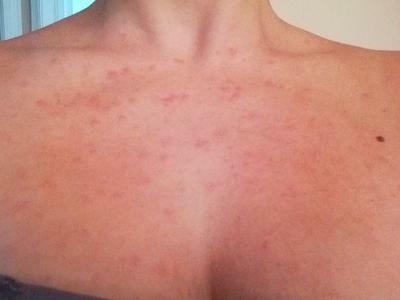 I have included a picture of my chest rash. If anyone has a diagnosis of my skin condition or can offer an effective treatment, I would be glad to here about it. So the doctor diagnosed it as contact dermatitis. After taking a course of prednisone, it went away. It was immediately better after the first dose of the steroid! I am still not sure exactly what chemical/irritant caused it though. Did you ever find out what it is? Join in and write your own page! It's easy to do. How? Simply click here to return to Pictures of Rashes.